Central vacuum systems often rely on resource-hungry pump technology like oil-sealed rotary vane or liquid (water) ring pumps. Both of these pump technologies rely on fluid to create a seal and generate vacuum. Replacing the sealing fluid imposes significant operating costs - in the form of maintenance, labor, or materials. VAC 24seven pumps are a dry, chemical resistant alternative to liquid ring and rotary vane pumps in many central vacuum systems. 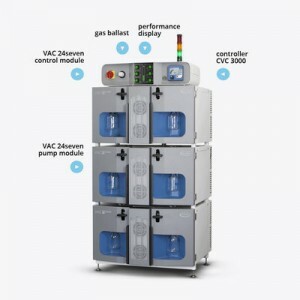 VAC 24seven pumps can be configured to provide an ultimate vacuum of 5 mbar (3.8 torr) or 70 mbar (52.5 torr); and can be configured to reach pumping speeds of 120 m3/hr. (70 cfm). Because VAC 24seven pumps use dry diaphragm technology and feature a fluoropolymer wetted path, these pumps require minimal maintenance and have extremely low operating costs. If you've got an aging central vacuum pump, let us know if you'd like to see if VAC 24seven is a good fit for your needs.